This week we're very lucky to have the director of A24's new film Never Goin' Back, Augustine Frizzell. 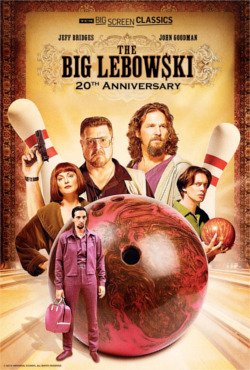 She's on the show to talk with April Wolfe about the Coen Brothers' The Big Lebowski. April and her discuss the friendship on screen between Jeff Bridge's character 'The Dude' and John Goodman's 'Walter', and how that relationship is the emotional center of the film. Augustine relates this to the friendship she crafted in her film, and how writing for those characters was walking a fine line between pathetic and endearing. They also compare these two films in terms of capturing the essence of a city; Los Angeles for The Big Lebowski and Dallas for Never Goin' Back. Plus, Augustine has a pretty fascinating story of how she came to filmmaking after being a broke, single Mom at the age of eighteen. And she explains how those life experiences helped shape her debut film. You can see Never Goin' Back in theaters now. Rocketeers, it's been a very strange couple of weeks. The gang all come together to talk about the recent events in Dallas, Baton Rouge, and Falcon Heights. This week, Guy, Oliver, Margaret, and Wynter escape reality for just a bit and talk about all things fantasy. Wynter and Guy just can't agree on Summer Jams, Oliver discusses his first Choose Your Own Adventure book, and Margaret tries to draw the line between sci-fi and fantasy. Time is running out for the search for the Song of the Summer. Look for the official thread on the Facebook page and send in your submission so Guy and Wynter can berate your choices on the show.